ARLINGTON, VA, February 25, 2014 – A national survey of parents with young children age 2-6 has found that media and technology are an essential part of preparing children to enter elementary school. Overwhelmingly, PBS KIDS stands out as the most trusted and relied upon media brand for this school readiness, ranking first in delivering on every measured skill. The findings were announced today by PBS KIDS, who commissioned the study with a leading youth and family research firm. The survey looks at PBS KIDS and other major children's media brands. Results show that American families are struggling to prepare their children for kindergarten and five out of 10 parents worry their child won’t have the skills they need when they start elementary school. In addition to academic skills like math and reading, parents recognize that a broader skill set is needed for early learning success today. When asked to name school readiness skills, parents cite math and reading first, but social and emotional skills rank first when parents are asked to rank skills in order of importance for learning success, with 88% saying it’s important that social skills be mastered before school. Among the resources used by parents to help develop kids’ social and emotional skills, TV shows are No. 1 for both categories (56% and 59%, respectively), followed by books (48% and 53%), electronic learning toys (25% and 21%), computer games (25% and 21%), websites (20% and 19%) and apps (18% and 14%). In fact, the survey shows that parents clearly understand the educational benefits of exposing their children to media and technology, with 89% in agreement that these resources can be partners in educating kids. Three-quarters (75%) have used new technology – computer games/activities, websites and apps – to prepare their child for kindergarten. Of those, 82% have used new technology to help their child develop math skills, 75% for reading skills and 67% for writing skills. Helping All Children Succeed: PBS KIDS has the greatest benefit to those most in need, the survey confirms. In fact, PBS KIDS reaches nine million low incomes families each year. Families with a lower household income report having fewer resources for school preparedness and are less likely to use technology or formal education to prepare kids for school. These families recognize PBS KIDS’ ability to help them prepare their children for school, with nearly two-thirds (63%) reporting that PBS KIDS “helps a lot” to prepare kids for school. Diverse Reach: PBS KIDS is especially important in African American and Hispanic households for school readiness help. Specifically, 71% of African American parents and 63% of Hispanic parents agree PBS KIDS helps prepare their kids. In comparison, on average, 37% of African American parents and 29% of Hispanic parents say the same for other networks. Preparing Kids for School: Parents confirm that no other media brand meets the readiness needs of children like PBS KIDS. When asked how well networks prepare children for school, 86% say PBS KIDS helps a lot/somewhat, topping the next closest network by 14%. Parents also rank PBS KIDS as the kids’ media brand most likely to offer activities and products that support basic math (86%), basic reading (83%), life skills (78%), social skills (77%), emotional skills (75%), personal hygiene (69%) and basic writing (67%). Improving Kids’ Behavior: In addition, PBS KIDS leads all networks in improving kids’ behavior, with 74% of parents saying their child exhibits more positive behavior after engaging with the network. Other networks have a smaller positive impact on behavior, with the next closest at 61%. Serving Families: No other brand serves families as well as PBS KIDS. Results show that parents are far more likely to use PBS KIDS content for school readiness than content from other networks in every category, including TV shows (65%), websites (58%), computer games and activities (58%) and apps (56%). Trusted by Parents: PBS KIDS is also the most trusted media brand and the brand parents are most likely to use for school preparedness. 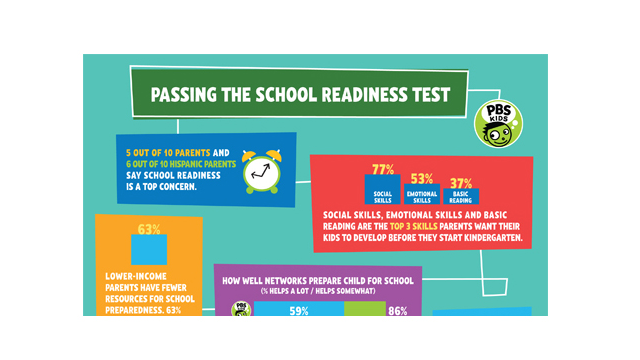 Sixty-six percent of parents say they completely trust PBS KIDS to provide high quality content, and 60% confirm they are extremely likely to use PBS KIDS for school preparedness, topping the next closest competitor by 12% in both categories. Additional tips and information for parents can be found in the child development section of PBS.org/parents. In addition, PBSKIDS.org offers free educational games and activities to help children build early math, reading and social and emotional skills. These findings follow recent industry recognition for PBS KIDS. In February 2014, PBS KIDS was named Channel of the Year and Best Channel Website at the Kidscreen Awards, which celebrate the year’s best in children’s media and broadcasting. PBS KIDS was also honored at the iKids Awards, which recognize the best digital media products and platforms, where PBS KIDS won for Best Website (Preschool) and Best Streaming Video Platform (Preschool). This survey was conducted January 11-25, 2014, by Smarty Pants. More than 1,000 parents with children age 2-6 completed the online survey. All respondents were aware of PBS KIDS and the survey base is representative of TV-viewing households with young children with regards to household income and ethnicity. Any statistical differences are at a 90% or higher confidence level.